I grew up outside of San Francisco, went to high school in Connecticut, and ended up at App because of mountain biking. My parents always encouraged me to pursue anything outdoors, even if it made my mom nervous. I was a bit of a handful as a child and I think that was their way to getting me out of their hair without sticking me in front of a TV. I picked up mountain biking and snowboarding at a pretty young age, that quickly evolved into building features and trails. I was working as a cook for a while and was really unhappy with it, all I wanted to do was build and ride so I decided to make it a reality. I now work for Beech Mountain building terrain parks as well as teaching both mountain biking and snowboarding. I grew up on Mt Tam and my dad was a mountain biker; some of my earliest memories are from a kids seat on the back of an early 90’s Specialized RockHopper. When I was in 7th grade I got kicked off the baseball team because I skipped practices to ride and I started racing downhill 6 months later. Whats your favorite trail at Rocky Knob? I’m going to have to go with Rocky Branch, it’s the original and I think it’s still the best. Mountain biking has shown me a ton of special places and introduced me to lots of extraordinary people, I can’t imagine what my life would be like without mountain bikes. My trail bike is a Santa Cruz Tallboy, my downhill bike is a Santa Cruz V10, and I’m working on a Santa Cruz Jackal for pump tracks and dirt jumps. What’s a favorite memory of riding? Once I was in Tahoe without a bike, helmet, or shoes; my plan had been to hike, fish, and hang out with friends. One of my friends found this plan unacceptable and insisted I take his bike, helmet, and shoes. I wasn’t planning on riding at all and ended up getting to go on some amazing rides. What type of riding do you prefer? My ideal ride could be done without a chain and would wear your pads to the metal. I really enjoy steep technical riding but if you try hard enough you can make any trail fun. What keeps you coming back to rocky knob? 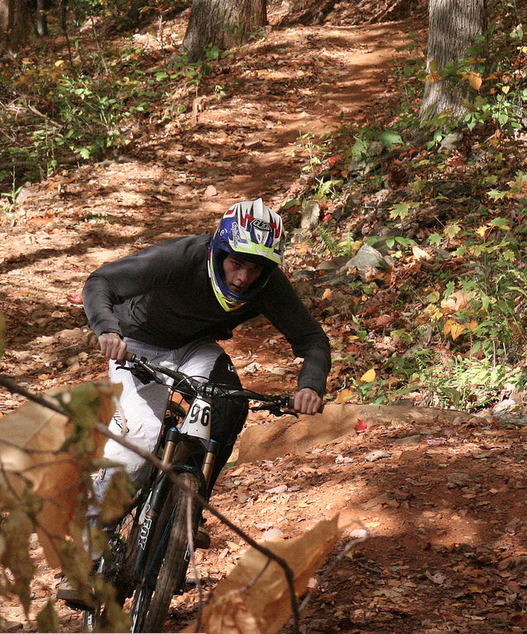 It’s a trail system that can be ridden in a lot of different ways, someone who has never ridden a bike can enjoy Rocky Knob but at the same time an expert rider can find things to keep them on their toes. Rocky Knob is also one of the only legal places to ride in the area so a pretty large community has developed around the park. Sometimes during the summer there will be group rides with upwards of 20 people, it’s always a good time. When riding whats your favorite word or adjective to use? The most common things you’ll hear from me on a ride are “I’m dying” or “you won’t do it”. 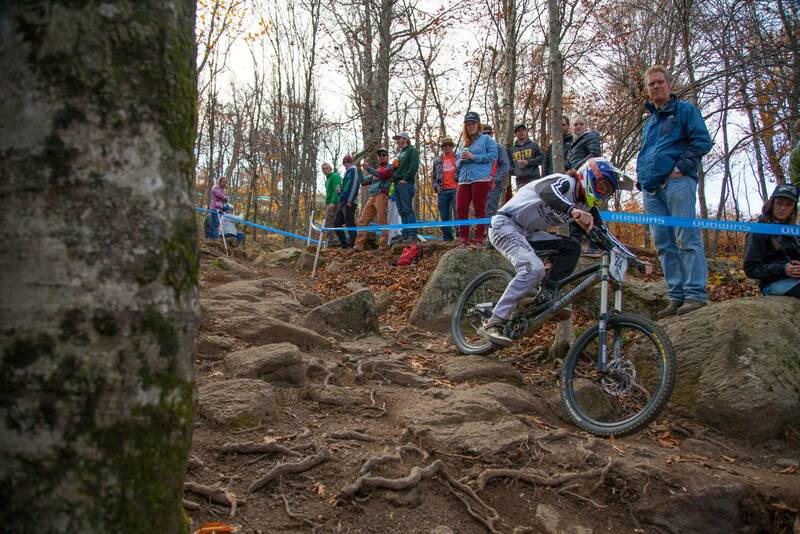 What advice would have for someone wanting to get into mountain biking? Start out with a used bike or a mid range hard tail, you’re going to break a lot of parts early on so you don’t want to get something expensive right away. Try to steer away from bikes that are very specific to certain disciplines, don’t get a downhill, dirt jump, or xc race bike right away. You won’t know what kind of riding you want to do until you’ve been at it for a while so you want to start with something that can do a bit of everything. If you’re every unsure about what product you should buy or how to ride something just ask for help, we all were knew to mountain biking at some point.